You will be guided through the intensive week to week programs which are split into progressive stages. Each stage has a number of weeks, where in each week you will be shown all the exercises and mobility work that is to be completed. In most weeks you will be given a detailed outline of the rehab program for that week, including do's an dont's, tips and exercise options. The program layout and videos work seemlessly across all devices with full screen video and super user-friendly touch screen navigation. 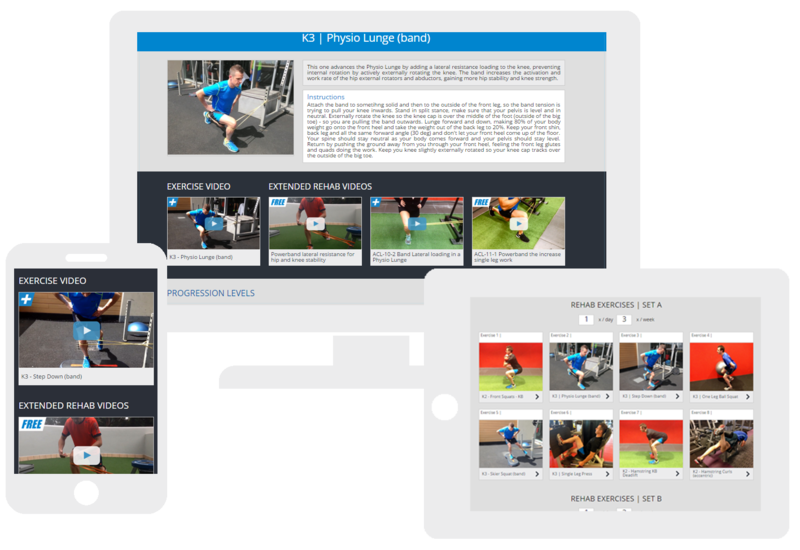 Each exercise in each stage has a detailed layout of imagery and videos of how to do the exercises, as well as extended educational videos of each exercise and progression levels to show how to increase (or decrease) the difficulty of the exercise should it be appropriate. There are also weekly exercise videos of patients just like you, who are going through the same stage each week for you to track, get tips and knowledge, as well as draw inspiration from during each stage. These rules are in place to make sure you follow the program correctly and at the right timing for optimal recovery. The weeks have been set as a guideline, however some people may be slower in their rehabilitation due to many factors and in some cases you may stay on a set week for two or three weeks instead of one, as you are not expected to always complete a 'week' in 7 days. It is also not advised to push yourself or progress before you are capable and you are not allowed to move onto the next week until you have completed the prescribed volume of exercises in that week. That is why there are pre-requisites to guide you through each stage and keep you on track. At the beginning of each stage you will be required to pass the pre-requisites in order to continue onto the next stage. These goals and guidelines are set and designed to help make sure you don't progress into a more difficult stage or series of exercises until you have certain range of movement requirements, can perform prior exercises correctly, adequately and enough volume as well as setting a benchmark for progression and goals. It helps ensure that all the exercises are completed without 'skipping' a workout or certain key exercises. It also aids in the prevention of pain as well as re-injury and gives you a correct level and speed of rehabilitation during each stage. When you view exercises in the library or part of a rehab program you may see that the exercise have progression (and regression) levels. This allows you to look at a more difficult or less difficult level of the same exercise to allow progression within the exercise. This is good for people who maybe stronger, more co-ordinated or have better stability with the exercise that others, so they can choose to progress the exercise to progress their recovery. However it is advised that you can only do this if you can safely, and effectively complete the exercise PRIOR to that. For example, if in a program week you are to do a Level 2 exercise, you must be competent and pain free with that exercise and be able to complete the required sets and repetitions (volume) in that week before progressing that exercise to a Level 3. It is not advised to jump ahead by 2 levels, nor attempt any exercise that is outside the set program of exercises given. At the start of each stage you are recommended to 'Check-in' by making an appointment with your local Physio to assess and monitor the progress of your rehabilitation as well as help you perfect and correct the exercises that you are doing in the program. This will help you keep on track and get the maximum benefit and results out of the rehab program. Getting started into an online Rehab Program is fast and easy. 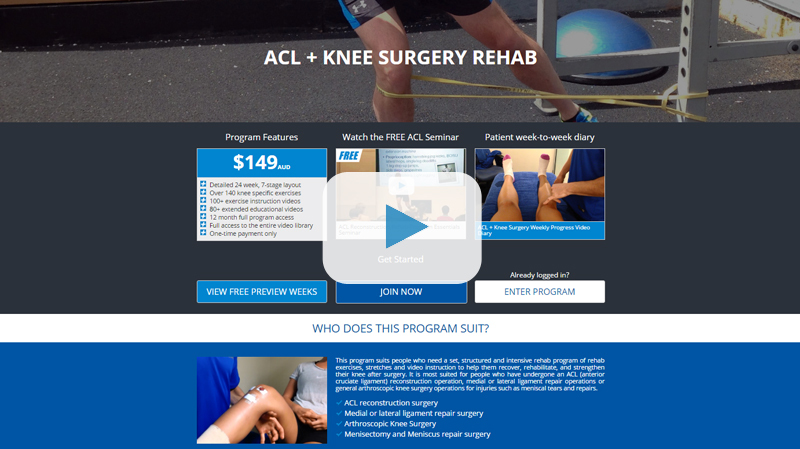 Simply choose the program you want, view the program details and the free preview weeks and free exercises and video content. Then when you're ready, click purchase program to create a user account and progress to the secure checkout for a one-time only payment for access to the program, as well as full access to the entire video library. To keep your payments fast and secure we use the E-Way secure online payment gateway system for all our online program transactions. 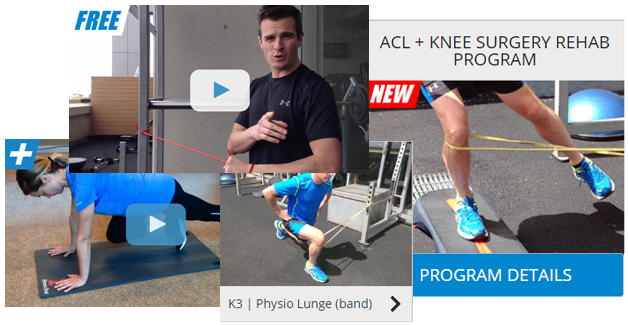 Enter your details here to receive new rehab videos and exercises as they are uploaded and new rehab program releases!